Air New Zealand’s first and factory-fresh Airbus A321neo is now flying, making its debut as NZ739 from Auckland to Brisbane on Friday November 23, and soon to appear on flights to Sydney and Melbourne as well. It’s the first of 13 new Airbus ‘neo’ (New Engine Option) aircraft to join the AirNZ fleet, and Australian Business Traveller was on board its inaugural passenger flight to see what the next-gen jet has to offer. … the closest substitute being the ‘Works Deluxe’ experience, when you purchase the highest-price economy class airfare. This pairs the typical business class staples of priority check-in and boarding with extra space on board – that’s in an economy class bulkhead row, extra-legroom or ‘Space+’ seat – along with complimentary meals and alcoholic drinks, and two checked bags (although not lounge access). 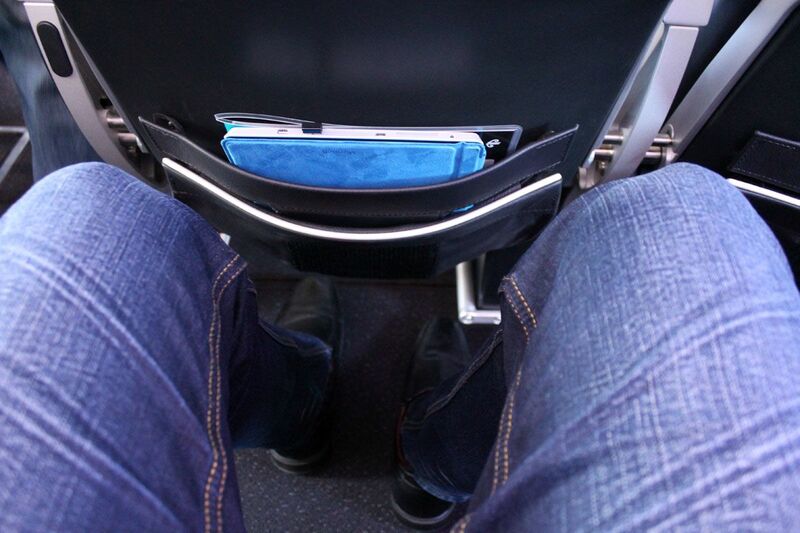 Assuming you’re in one of these extra-legroom seats, knee room is more than ample – most seats have a pitch of 83cm (32.7 inches – pictured), although some are a little cosier at 81cm/31.9 inches. … which is adequate for dining, but on the smaller side for any laptop work. 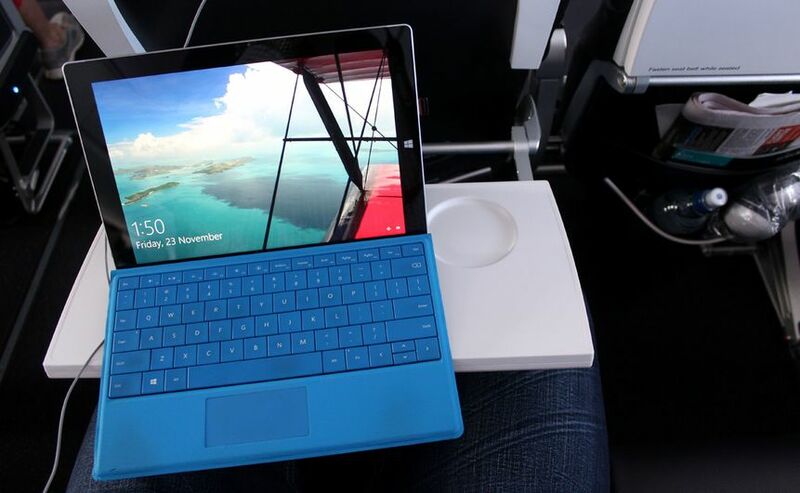 I was still able to type comfortably on my Microsoft Surface, which already places the centrally-mounted keyboard at a downward angle by design, but this may not suit all devices. To the seat itself, I found it relatively comfortable when sitting upright, given it has an adjustable headrest and plenty of padding, but when working on my laptop, edged it back just slightly for a tad more working space, which still gave plenty of room for the passenger behind. 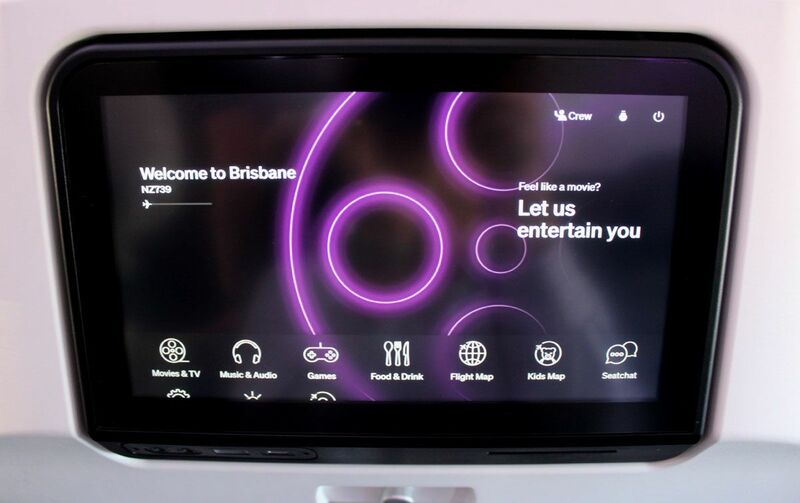 … with content provided via fixed entertainment screens, which respond to soft touches and swiping gestures – unlike older inflight monitors which need to be pressed much harder or with the tip of your nail. The content you’ll have access to depends on the fare type you’ve booked. Passengers travelling on Seat and Seat+Bag tickets have access to complimentary TV shows, music and games (movies available for purchase), while guests on Works and Works Deluxe fares get movies at no extra charge. … and tucked away below the display monitor are two headphone connectors. You can plug a regular, single 3.5mm headphone connector into either port for stereo sound; a dual-pin aircraft-type plug, again for stereo sound; or can connect two pairs of headphones to watch a movie together with your seatmate. Next to that, you’ll also find a typical USB power port for charging small devices like smartphones, alongside a slim USB-C outlet: useful if you have a relatively new device that adopts this standard. However, this is instead of a standard AC power port, so if your device isn’t USB-C capable, or it doesn’t charge via USB at all, you’re out of luck. Even then, the outlet supply is limited to 27 watts, which is ample for smartphones and tablets and sufficient for a 29-watt MacBook Air, but as larger MacBook Pro models ship with chargers of up to 87 watts – ditto other larger laptops – these devices will charge slowly at best, or when in use, lose their charge at a lower rate than running on battery power alone. 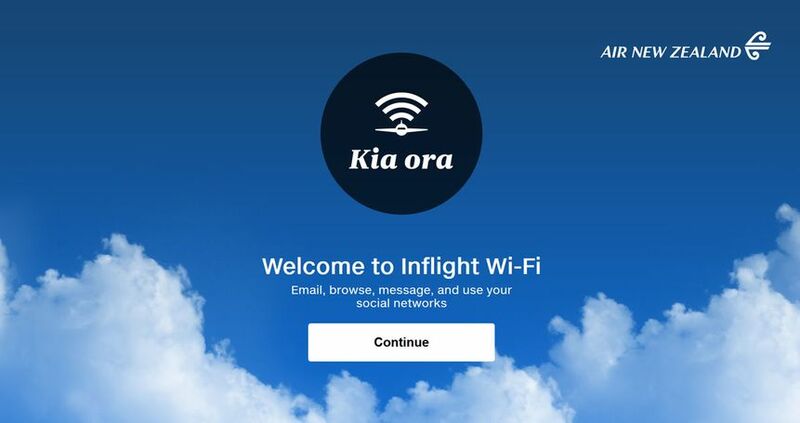 Finally, this aircraft – and all of AirNZ’s future ‘neo’ jets – will offer inflight Internet, as is already available on some of Air New Zealand’s other planes. 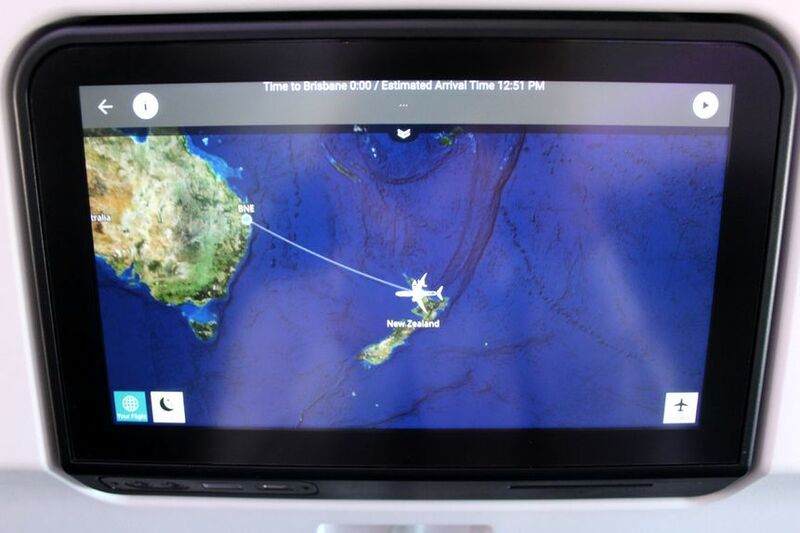 On this inaugural flight, all passengers had complimentary access, although normal pricing is NZD$30 for a flight pass on journeys between Australia and New Zealand, as was charged on my Boeing 777 flight from Brisbane to Auckland earlier the same week. Being the plane’s first passenger flight, the WiFi service was still being tweaked with engineers on board, and went offline for about half an hour after take-off while the system rebooted. When it came back online, downloads of 1.4-4.7Mbps and uploads of 3.2-5Mbps were measured. That’s very reasonable for a satellite connection, particularly in the sky, and was more than usable as it wasn’t ‘announced’ that the connection was free – only revealed if you logged in for access – but if every passenger had connected, those speeds wouldn’t have been achievable, of course. 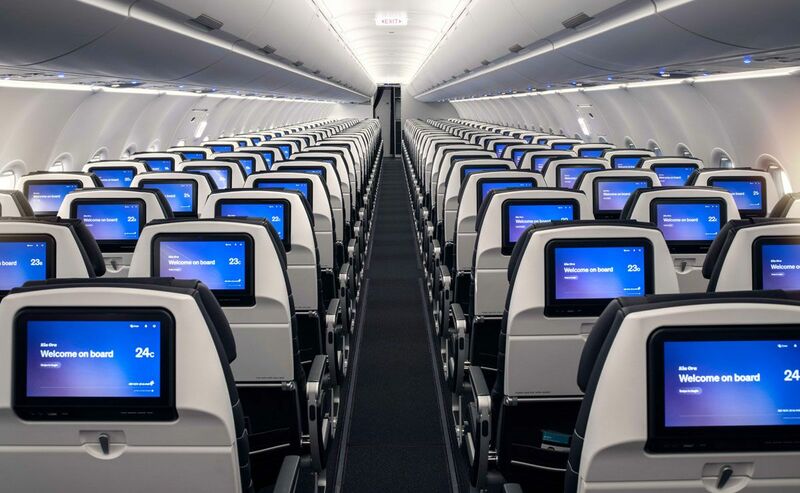 All in all, Air New Zealand’s Airbus A321neo is a welcome addition to Australian skies, and while it may not feature business class as on the airline’s Boeing 777 and 787 jets, the Works Deluxe experience isn’t a bad option if one of these all-economy flights is the best fit for your schedule. 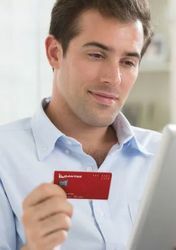 Just note, airport lounge access isn’t included as standard with Works Deluxe and can’t be purchased from AirNZ, so have your Star Alliance Gold card or Air New Zealand Koru membership card attached to your booking for access to the airline’s lounges – or a Priority Pass card for other lounge options. I'm assuming the credit card feature to buy movies on board is still available? Sometimes use this on a seat only fare. And did you have a chance to sit in any of the smaller seats? Hi kiwiwings, from the article: "Passengers travelling on Seat and Seat+Bag tickets have access to complimentary TV shows, music and games (movies available for purchase)", and yes, you can pay via credit card to make that payment, as before. Being a commercial flight (and a full one at that), I wasn't able to go seat-hopping, unfortunately. It’s a interesting concept. I’d say remove the loco +Bag stuff, and considering Virgin have ditched it they probably could follow suit and get away with it, but will obviously mean more expensive fares. It cheapens the image. Virgins edge is no doubt free bag and business on every flight. ANZ have a better IFE but seat pitch is better at VA.
Would have be great to see ANZ bring out a narrow body business product. 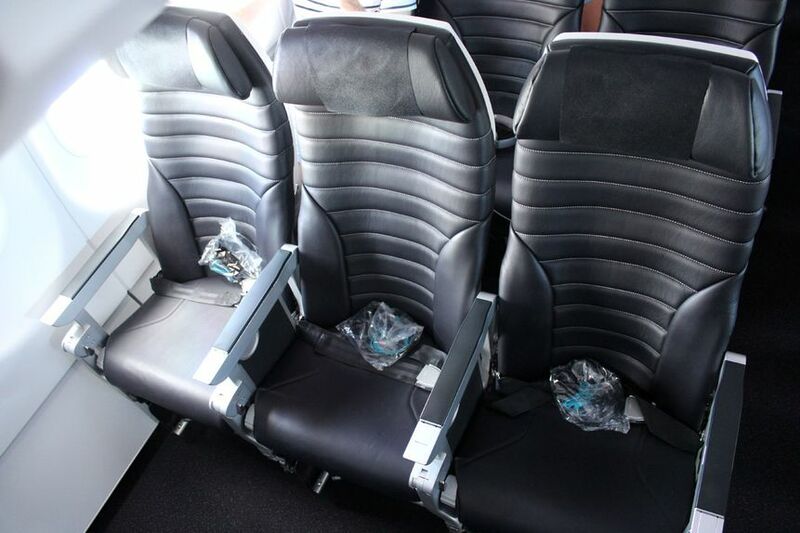 Why would Air NZ rule out a large part of the market by dropping the Seat and Seat+Bag products? Also, Virgin (and Qantas) don't provide you a "free bag" on each flight, you're paying for it one way or another. The Works product from Air NZ competes with VA/QF. 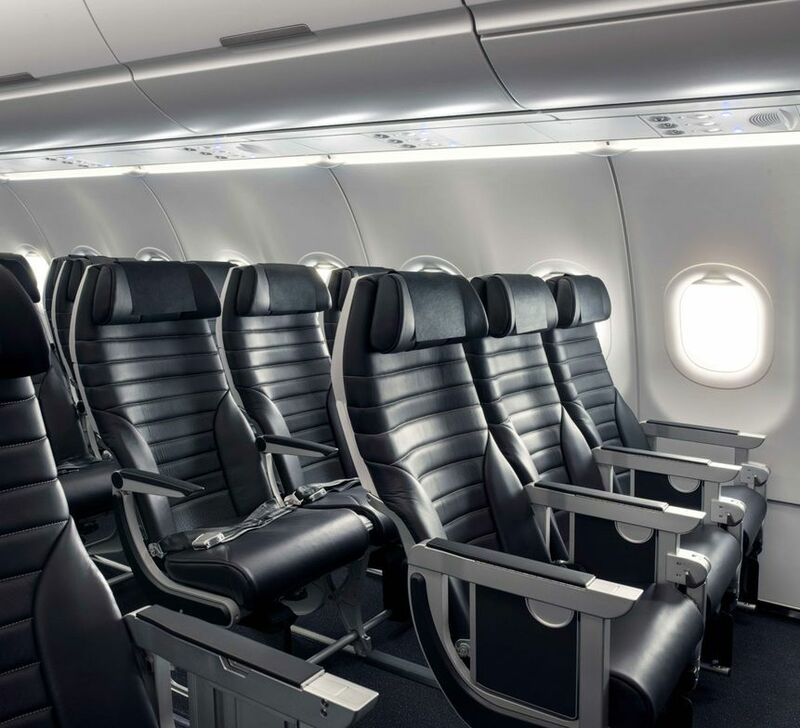 Air NZ has found, there is no requirement to have a Business Class product on the A321/A320 international fleet, as the fleet is mainly for the leisure market. Air NZ has researched Airpoints Gold and Gold Elite members and found they are happy to pay for Seat or Seat & Bag fare for flights under 4 hours. 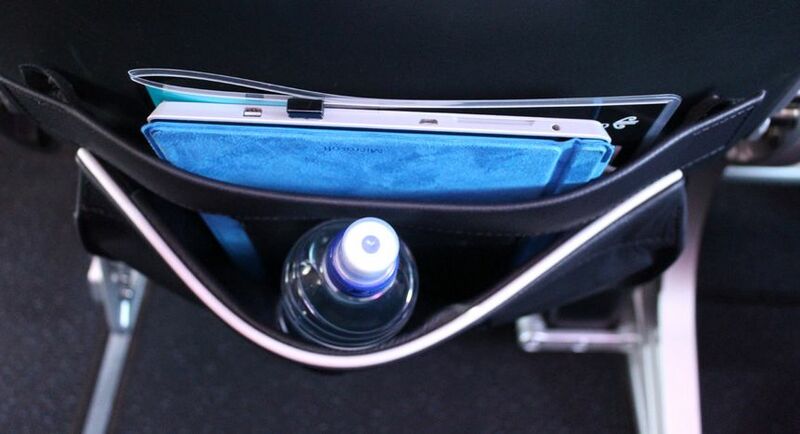 If they or other business travelers want a business class product, then they fly the wide bodies. "If they or other business travelers want a business class product, then they fly the wide bodies." Right, if they live in Auckland. Wellington, Christchurch and Queenstown you can do direct trans-Tasman with NZ on the A320/321 all economy low-cost-carrier only (Queenstown runway is too short for widebodies anyway). Otherwise you have to do a domestic sector to/from Auckland, change terminals and generally waste your time. So how about some business seats for ports other than Auckland? Its not going to happen on the the A320/A321's. 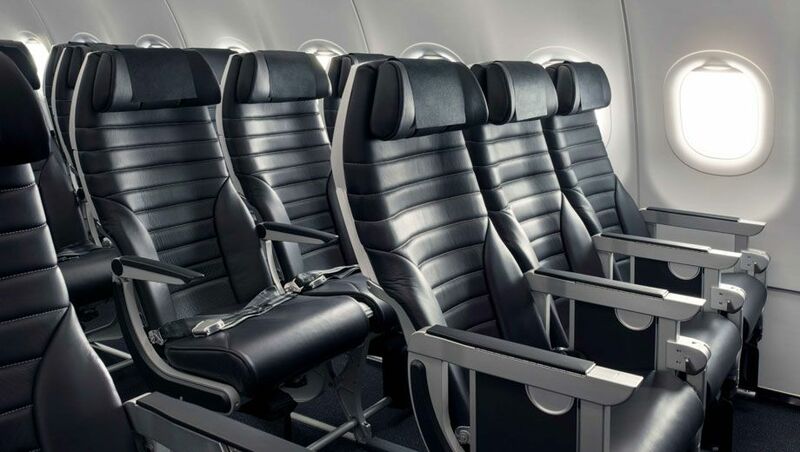 As mentioned, Air NZ has researched the business market and have found business travelers are happy with the Seat, Seat & Bag, the Works and Works Deluxe products and fares. Most of Air NZ business travelers are from NZ and lessor from Australia. The other factor in all economy configuration, that is Air NZ has greater fleet flexibility especially in the leisure market and better aircraft utilization compared to Qantas and Virgin Australia. Would still fly their wide-body 787/777 flights. The majority of NZ’s Tasman passengers are flying Seat Only or Seat & Bag, why give them an free meal and drink? When the majority of the market thinks they must be gettting an great deal. NZ has built them self up an large locally following, who will just go directly to NZ’s site to book an short-haul fare. 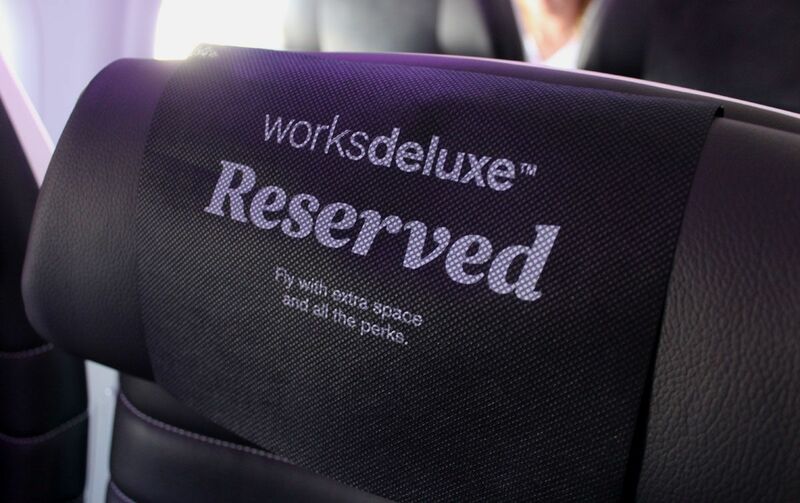 The "works Deluxe" might guarantee the seat next to you is empty but quite a lot of travellers don't realise that you share that space with the other passenger on the other side of this seat. Sure it gives you extra elbow room on one side but not exclusive use of the middle vacant seat. This caught some of my family members out who thought the space was theirs only and they could stretch right out . Bit of a let down really!! I would have thought that was obvious, having booked it myself. Not at all "obvious" as it happened on a couple of occasions to friends/ family so it can be misconstrued. What's the leg room like at the regular Y seats? Hi stmaus, you can find that here in one of our earlier articles. 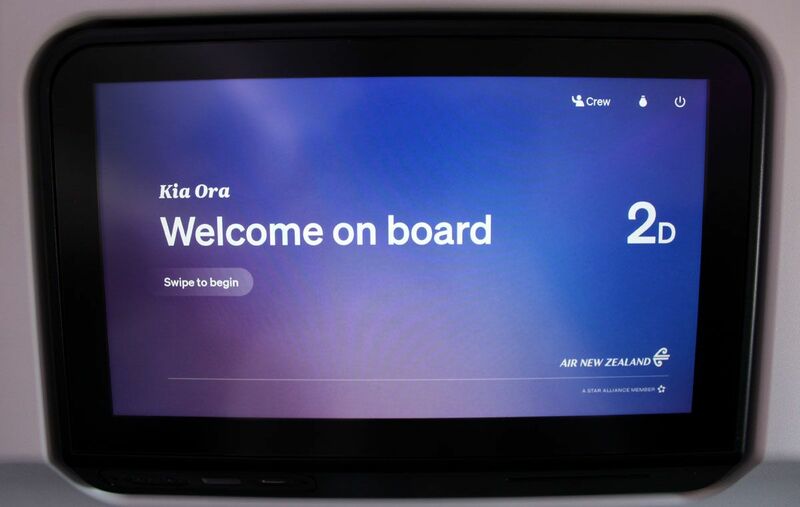 Just flown on the A321neo AKL/MEL/AKL 25/26 Nov 18, the seat and legroom is good especially with the 74cm pitch seats which I flew AKL/MEL but beware, due to the seat design that allows for more comfort and legroom, the IFE screen is almost in your face which can be hard on your eyes and even more so, if the person reclines their seat. The seats that have 81cm and 83cm pitch are good for Trans Tasman travel. The seats being used for the A320/A321neo are latest generation of slimline seats and are comfortable for 3-4 hour flight. Maybe, before you write an piece like this you check the Air New Zealand web site that shows 3/4 of the seats are 76cm (29.9 inches) and 74cm (29.1 inches) seat pitch. This is a new low for Air New Zealand. Maybe before you comment, you actually fly on the aircraft. These are a new seat design, and having sat in the rear seats myself, the leg room is equivalent to an older 737 seat with 30-31” seat pitch. Porkster: We've already covered the seat pitch issues you describe in a previous article, but this piece is based on the experience of flying in the Works Deluxe / Space+ seats, so that's the focus here (in the same way that when we publish a business class review, we don't go into detail about the experience further back, as it's not the focus of the article). 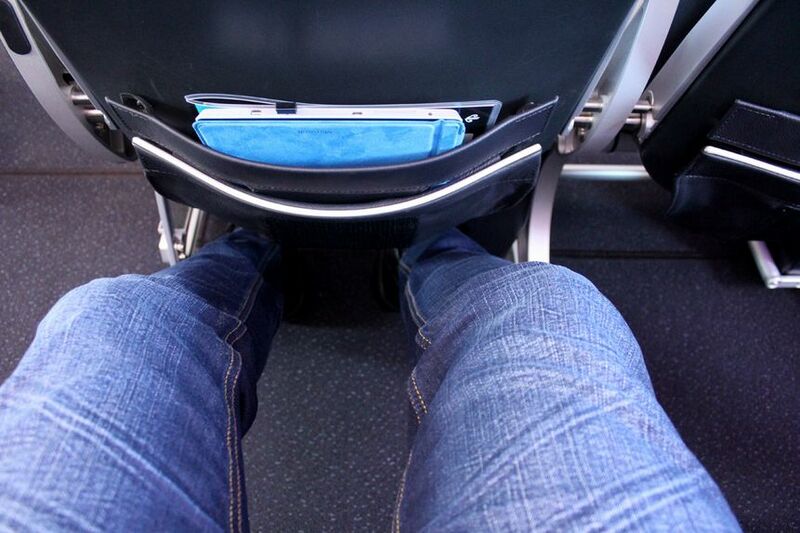 You can find our tips for choosing the seats with a little more legroom than others in the article linked above. 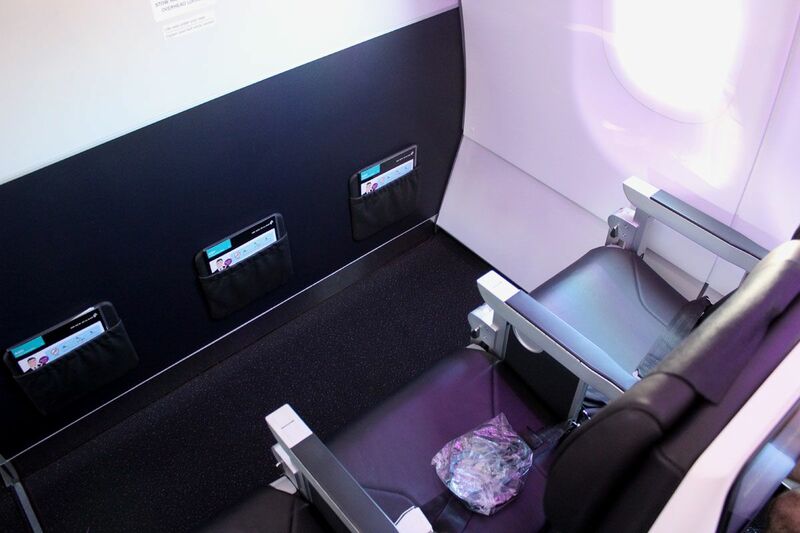 Comment on "What it's like to fly on Air New Zealand's new Airbus A321neo"